Each day is a chance to begin something new, fun & amazing! I’m moving into a new creative process with my Wild Side leather line… Now I’m creating “Warrior Princess Bags” & next Leather Vests that will be more like works of art than clothing. It all starts with an idea or image in my mind. I keep an ongoing journal of every idea ~ then eventually I do my best to create it. Anything is possible. Take a chance and do something new! 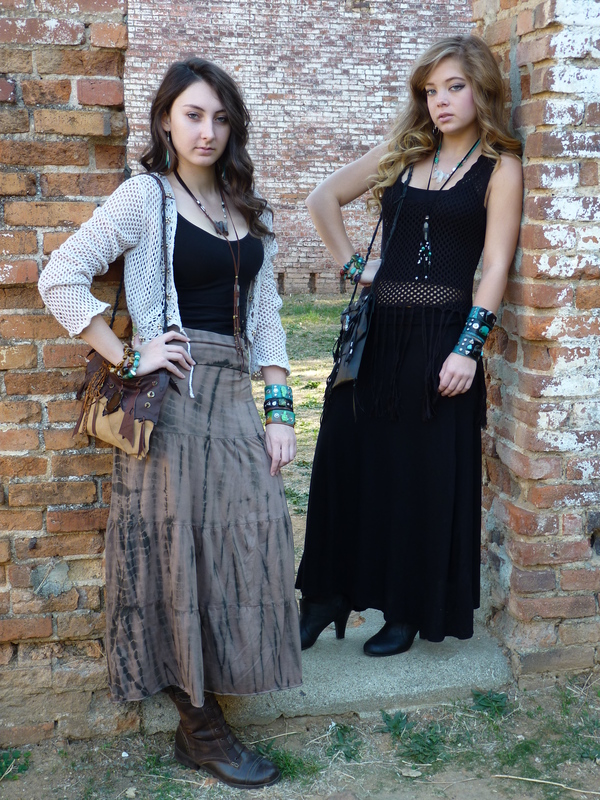 Pictured below ~ my beautiful Gypsies modeling two of the new bags! Keeping things fresh is a great way to feel more alive! I love trying new things… whether it be activities, food, movies or even business ventures. For me it can be about creating new art and jewelry or expanding my intuitive skills. But even going to an exotic restaurant or visiting a place that you’ve never been before can infuse your reality with some excitement. So mix it up and feel more alive every day! One of my favorite hobbies ~ I love taking photographs. It’s a wonderful way to express myself and to promote the jewelry I create and to infuse my creative energy!